Can you picture endless possibilities? Can you imagine an online platform, in which you can socialize, interact and not really have the need to leave your house? There are webpages and online games now in which people can take on quests and meet other players, but they aren’t fully immersive. Usually you use a controller, or you click the arrow keys on your computer, and you communicate with the other players through a camera, a headset or in writing. But if you could go one step further, would you? Would you be willing to make friends through a virtual world? Would you be willing to go bungee jumping, hunting, skiing, swimming, and dancing through a digitalized world? We already interact and meet others through the internet, through webpages or online apps. Think of Facebook, Instagram, Twitter, Tinder, Bumble, or the many other networking webpages and apps accessible with the internet. So socializing online isn’t that far-fetched, we do it all the time, but would you stay at home, and virtually put on your party dress and go dancing with your friends without actually ever leaving your house? Is that too much? Is it unhealthy? Writer Ernest Cline, has come up with a virtual reality story that will be out in theatres by the end of March 2018. 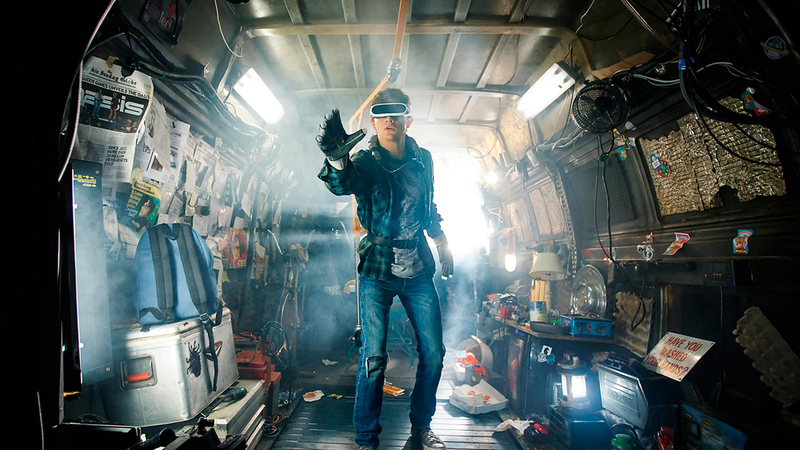 Ready Player One, directed by Steven Spielberg, is set in a futuristic world of 2045. The OASIS is a virtual space built and designed to connect people. But it becomes a form of escapism for the tedious impoverished life of some of the story’s inhabitants. Virtual Reality is taking tremendous leaps that the premise of this film might, in the future, come to pass. Just go back a few years. In the original Star Trek, the spaceship The Enterprise had a “replicator”, now we have 3D printers. Sure things don’t just pop out of thin air, but 3D printers can make jewelry, space parts and even body parts. Do you remember the old space cartoon, The Jetsons? They had slim TVs now we have flat screens. Isn´t it crazy how much tech seen in science fiction books and movies is now available? How it is the norm? How there are children that don’t know phones and controllers used to have cords? We have iPads, touch screen phones, slim laptops, google glass (glasses that have a tiny screen that connect you to the internet), antigravity rooms (indoor skydiving), space travel, credit cards, instant messaging, Skype and FaceTime, wireless headphones, submarines, heat rays, military armor pretty much like Iron Man’s suit, and so much more. So is it hard to believe that in a few years, the premise of “READY PLAYER ONE,” might come to pass? For some, the thought might be exhilarating, for others it might be terrifying. There are those who will always prefer the outdoors, the real world. But there will always be people who look to the technological future in awe, waiting for Science Fiction to become reality. ELIMINAMOS LAS BARRERAS ENTRE NOSOTROS Y EL MUNDO DIGITAL.